The ancient Greek philosopher Aristotle once philosophised about money and its role in society. After much thought, he concluded that in order for something to be money, it needs to be portable, durable, divisible and must also have intrinsic value. Other economists have since theorised that money should also be uniform, fungible and limited in supply. It is these properties that have made precious metals money for thousands of years. Gold has been used as a unit of account and as money in trade since Biblical times. Throughout history, governments have used gold as currency and as a reserve to back their paper currencies. In fact, central banks still hoard thousands of tons of gold as a hedge against unforeseen currency events. Gold is portable, durable, uniform, fungible, limited in supply and has intrinsic value. However, it is not easily divisible, as to do so it must first be melted down and recast. Fiat currencies on the other hand, offer all the characteristics of money aside from not having any intrinsic value or being limited in supply. By comparison, Bitcoin is easily divisible, has intrinsic value and is limited in supply. Bitcoin is sometimes described as being “digital gold” or “gold 2.0.” This is because both gold and Bitcoin offer to solve the same problem, albeit through different means. As bearer assets, both gold and Bitcoin have no counter party risk. They can both be used as a form of immutable, censorship resistant payment, and also as an alternative to the legacy financial system. Another similarity between gold and Bitcoin are their creation processes. In order to create a gold coin, gold ore must first be mined, refined and minted. The amount of gold that can be extracted from a mine decreases over the life of a mine until the mine is exhausted of all of its gold. It’s interesting to note that Bitcoins are also mined in a similar fashion. The Bitcoin algorithm is programmed such that the output of mining new Bitcoin also decreases over time. The rate of new Bitcoins that can be mined is halved approximately every four years until the year 2140, when all Bitcoins will have been mined. Both gold and Bitcoin are decentralised forms of money. However, it can be argued that in order for gold to work efficiently as money, it must first be centralised in a single location and be accounted for. This creates the risk of theft or fraudulent accounting by the custodians of the gold. Bitcoin doesn’t exist in any single place at any particular time, making it perhaps the only unconfiscatable asset on Earth. Bitcoin is also more easily identifiable than gold. In order to verify the authenticity of a gold bar or coin, it must first be melted down, tested and recast into a new bar or coin. By comparison, counterfeit Bitcoin simply can’t exist. This is because the integrity of a Bitcoin is verified by the network during a transaction, similar to it being melted down and recast instantly as it passes through the network. Gold and Bitcoin are both limited in amount, which is an essential characteristic of sound money. 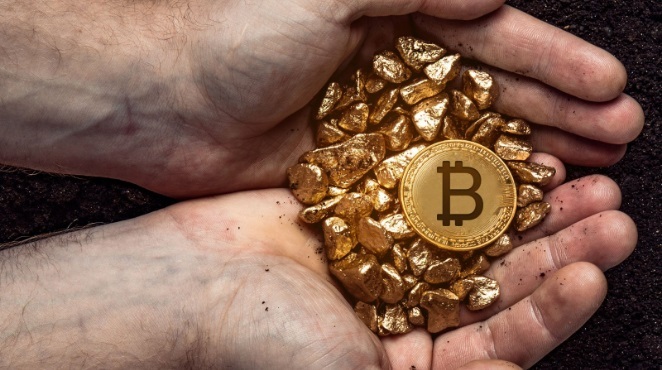 But the number of ounces of gold in existence, and also the amount of unmined gold in the Earth’s crust is unable to be accurately calculated, whereas the exact number of Bitcoins that have been mined and are further to be mined in the future can be cryptographically verified at any given time. Gold has a 2,000 year track record as a store of value and as money. History has proven it to be useful in times of economic uncertainly and during currency crises. By comparison, in its brief nine year history, Bitcoin’s resilience and utility has not yet been fully tested during a time of global crisis. Isolated events such as the bank bail-in in Cyprus or the currency collapses in Zimbabwe and Venezuela have seen Bitcoin act as a safe haven asset in those regions. But how Bitcoin behaves during a global event, or even a US or European recession is yet to be seen. Over the course of history, the price of gold has remained relatively stable compared to other goods, commodities and services, making it a tested store of value. The wild fluctuations in the price of Bitcoin in both directions are typical of a new and upcoming technology. However Bitcoin is not yet a suitable store of value due to these fluctuations and also because of its small market size. But as awareness and popularity grows, Bitcoin may one day be seen as an alternative to gold as a store of value. Bitcoin mimics the same properties which make gold useful and updates them for the modern world. The ability of Bitcoin to be transferred digitally, to be divided effortlessly and accounted for electronically makes it an ideal competitor to gold in our modern age. Only time will tell what role gold 2.0 will play in global commerce.